There is still time to register for many Samford University Family Weekend events and Parents Academy classes, according to Director of Parent Programs Susan Doyle. Registration must be done by midnight Sunday, Sept. 24. 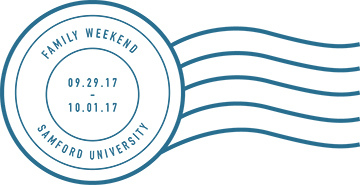 Family Weekend is Sept. 29-Oct. 1. Events with available tickets remaining include the Samford soccer match on Friday, the Samford Theatre production throughout the weekend, the parents breakfast and tailgate lunch on Saturday. Jim ‘N Nick’s Barbecue will be catering the tailgate lunch. There are also both general admission and reserved seat tickets available for the football game. Doyle encourages parents to register even if they are not attending Parents Academy classes or buying tickets because there is a gift with a postage stamp featuring Mr. Beeson and Samford postcards. Parents can pick up the goody bags at check-in which will be held Friday and Saturday in the Howard Room of the Beeson University Center. If there are parents who want a spot in one of the Parents Academy classes, Doyle asks they email parents@samford.edu to be placed on a waiting list. She also asks those parents who have registered but cannot attend to email her at sdoyle@samford.edu. For more information about Family Weekend, visit samford.edu.